Campers who need an all-in-one survival tool have the famed Swiss Army Knife. And business folks who are looking for an all-in-one productivity survival kit have B-Folders 3. This handy tool is more of a suite than just a utility, and what it lacks in user-friendliness, B-Folders 3 more than makes up for with its performance. B-Folders 3 uses a three-paned interface that makes it easy to navigate through all of the info you have stored. 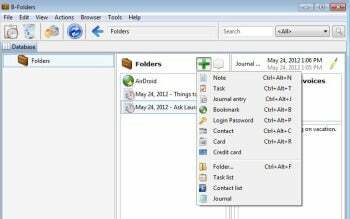 B-Folders 3 includes a laundry list of features: It's a bookmark manager, a contact manager, a journal, a notepad, a password manager, a task manager, and more. How to access all of these features isn't immediately apparent when you launch the desktop application. But once you click through B-Folders 3's three-paned interface, how to access its feature set becomes more apparent. It uses a tree-like folder structure, so you can move up through its levels easily. The left panel provides an overview of your B-Folders database, where you'll see a list of all the folders you've created. The center panel is where you add new items. Clicking on the big plus icon at the top of this panel brings up a list of available features: you can choose to add a new folder, note, task, journal entry, etc. You create the actual entry itself in the third panel, where you enter the information you want to store, as well as any notes on it. While B-Folders serves as a one-stop repository for all sorts of information you need to track, that's only part of its appeal. The other part is its security. B-Folders uses a "government-grade 256-bit AES cipher" to keep your data safe from prying eyes. You can set your database to lock after a certain period of inactivity, or you can manually lock it at anytime while using the application. B-Folders 3 also includes syncing features that let you share your data across devices. The $30 desktop version runs on Windows, Mac, and Linux PCs, while a free Android version runs on devices running version 1.6 or higher of the mobile OS. Information can be securely shared between multiple computers and mobile devices, but B-Folders does not use a cloud service to do so. Instead, it uses peer-to-peer technology that automatically detects and syncs any changes. B-Folders is able to detect devices on the same network that are running the software, in order to establish the necessary connection. It can work with an Android device over a 3G connection, too, but you have to do a bit of setup work in order to make it work. B-Folders 3 isn't the flashiest productivity application or utility around. But it's certainly one of the most useful I've tested. If you have a lot of information that you need to keep organized across multiple devices, B-Folders 3 is certainly worth a look. Securely share and store your data with B-Folders 3.